The worldwide economic recession stunted the growth of the digital imaging supplies market in 2008 and 2009. In order to save money during the downturn, many businesses purchased less expensive—and often generic—toner cartridges. A new report from Lyra Research’s Hard Copy Supplies Advisory Service (SAS), Aftermarket Share Increases: Toner and Toner Cartridge Market Forecasts, 2006–2013, discusses how this trend impacts the overall supplies market. The report also provides details about the segments in which aftermarket toner cartridge share is greatest and those in which original equipment manufacturer (OEM) share is highest; the pricing differences between OEM and aftermarket cartridges; and the forecast revenue opportunity for both OEM and aftermarket cartridges worldwide. The worldwide economic recession stunted the growth of the digital imaging supplies market in 2008 and 2009. In order to save money during the downturn, many businesses purchased less expensive—and often generic—toner cartridges. 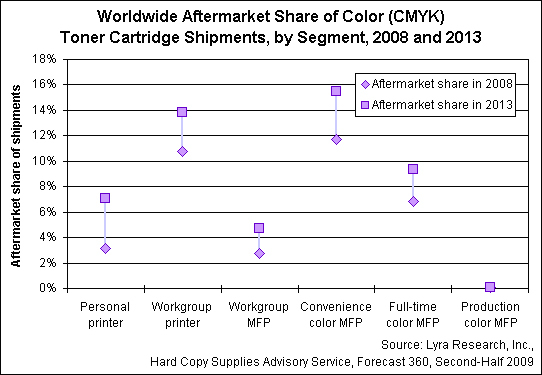 A new report from Lyra Research’s Hard Copy Supplies Advisory Service (SAS), Aftermarket Share Increases: Toner and Toner Cartridge Market Forecasts, 2006–2013 (http://www.lyra.com/lh3m.nsf/AdvisoryServices/SAS), discusses how this trend impacts the overall supplies market. The report also provides details about the segments in which aftermarket toner cartridge share is greatest and those in which original equipment manufacturer (OEM) share is highest; the pricing differences between OEM and aftermarket cartridges; and the forecast revenue opportunity for both OEM and aftermarket cartridges worldwide. The one bright spot that Lyra foresees for the slow-growing supplies industry is that overall growth of aftermarket share for the color toner cartridge and container market is expected to reach 10 percent by 2013. Lyra predicts that aftermarket toner cartridge market share will grow in each color laser market segment from 2008 to 2013 (see figure), except for production-class color copiers, which will continue to account for less than 1 percent of share. Production-class color copiers are often leased. These leases tend to include hardware and supplies, which limits the opportunity for aftermarket companies to provide compatible or aftermarket supplies for these machines. To learn more about the issues that are challenging OEM and aftermarket toner cartridge suppliers and to purchase Aftermarket Share Increases: Toner and Toner Cartridge Market Forecasts, 2006–2013, go to http://lyra.ecnext.com/coms2/summary_0290-1037_ITM. The forecast data included in this report is essential to both OEM and aftermarket toner cartridge vendors and can help product developers, marketers, and planners understand what has become a very uncertain market. Aftermarket Share Increases: Toner and Toner Cartridge Market Forecasts, 2006–2013 is currently available and can be purchased for $950. For more information, contact Sandy Tobin, client relations manager, at 617-454-2612 or stobin@lyra.com, or visit our online store at http://lyra.ecnext.com/coms2/summary_0290-1037_ITM. Sign up now for Lyra’s Research Briefs—Hard Copy, Marking Supplies, Media Supplies, Consumer Imaging, Europe, and China—which feature forecast information and primary research data. Research briefs are delivered approximately every quarter. Special bulletins that contain information regarding Webcasts and events related to each of the topics in the briefs also are distributed. To update your profile and add your name to our mailing list, click here http://visitor.constantcontact.com/d.jsp?m=1101693414919&p=oi and enter your e-mail address. Instructions that explain how to join the appropriate list will be e-mailed to you. Selling cartridges, ink, toner, and media to an ever-increasing number of end users demands a keen understanding of various user environments—corporate, commercial, small office/home office, and home—each of which requires different marketing, packaging, and distribution channels. Lyra Research’s Hard Copy Supplies Advisory Service (SAS), a high-level, online strategic and tactical planning resource, provides the advice that vendors need in order to thrive. The SAS allows clients to augment their product development, competitive intelligence, and marketing functions without the addition of costly staff. The SAS consists of six components: ongoing expert consultation, shipment and revenue forecasts, primary market research studies, analysis reports, industry news and updates, and an annual briefing. Lyra’s online content delivery also features a continuous flow of market data, analysis, and insight that provides a top-to-bottom depiction of events and trends in the imaging supplies industry.